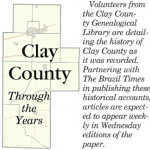 Volunteers from the Clay County Genealogical Library are detailing the history of Clay County as it was recorded. Partnering with The Brazil Times in publishing these historical accounts, articles are expected to appear weekly in Wednesday editions of the paper. Following the declaration of war by Congress, a meeting was held in Indianapolis on Thursday, April 5, 1917, for agricultural and business men, at the request of Governor Goodrich. It was the patriotic duty of every citizen to increase the food production during the war, the keynote of this meeting. It was pointed out that prices were likely to soar in Indiana unless some action was taken in a way of restriction. Former Congressman Moss of Ashboro was elected to head the executive committee. More than two hundred farmers and food producers of Clay County, representing every township, responded by attending the meeting. It was resolved that it was their patriotic duty to put every available acre into cultivation to further increase the nation’s food supply during the war. William F. Mullen of the Mullen-Blackledge-Nellis Company, said that his company furnished one-half of all canned soups used by the United States soldiers in Cuba and the Philippines and if farmers would raise the vegetables that the company would be situated to take care of the preserving end of the food pledges. A.C. Fisback said that Indiana had never faced a famine and if the people became panicky and stored up their shelves months in advance, that the situation would be made even worse. He, also, strongly advocated the return of all young men to the farm to assist the old people who were unable to work. The Senate has declared that a state of war with Germany now exists. It is not necessary for me to tell the people of Brazil to be patriotic and loyal, for I know that they are all of that. I will be proud to see the people of this city serve the nation in every way possible. Our food factories should be offered for the use of the government. Our several foundries and machine shops should extend aid to Uncle Sam. It is vital that we begin now the conserving of food supplies. I believe it is essential that every vacant lot of ground and every available garden plot be planted with vegetables. Every family should make an effort to raise at least part of the vegetables it will need, and if possible, have a surplus. Preparedness to meet whatever the future may bring is our patriotic duty. Now is the time to prepare.